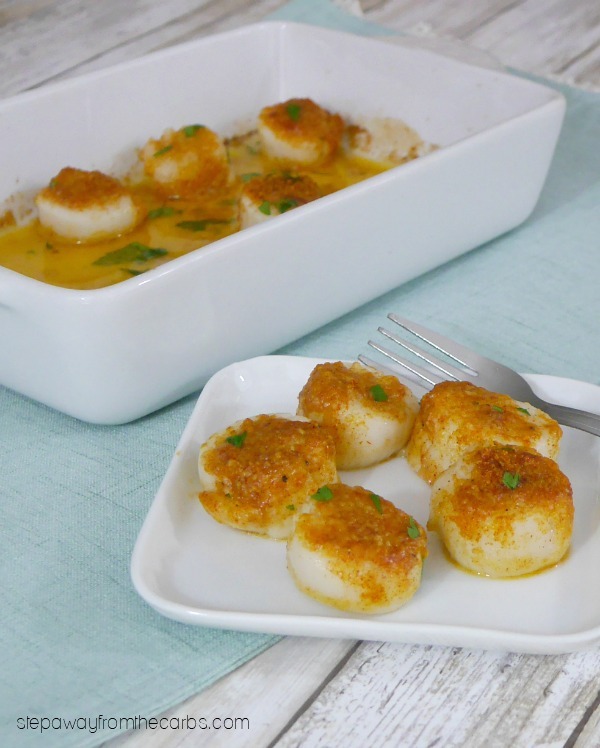 These low carb baked scallops are the perfect appetizer to share on a special occasion! 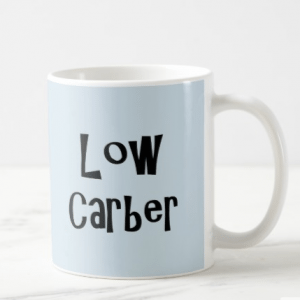 Keto, gluten free and LCHF recipe. I hardly ever cook scallops, and when I do, I regret not cooking them more! I saw these sea scallops on sale and snapped them up immediately, because I guess the downside to scallops is (usually!) their price! I’ve pan-fried them before and loved them, but I really wanted to try a recipe that was more hands-off. If I’m cooking these for a special occasion, I want to be spending more time with that person and less time in the kitchen standing over a skillet! For the breading, I’ve used a seasoned Parmesan mixture. 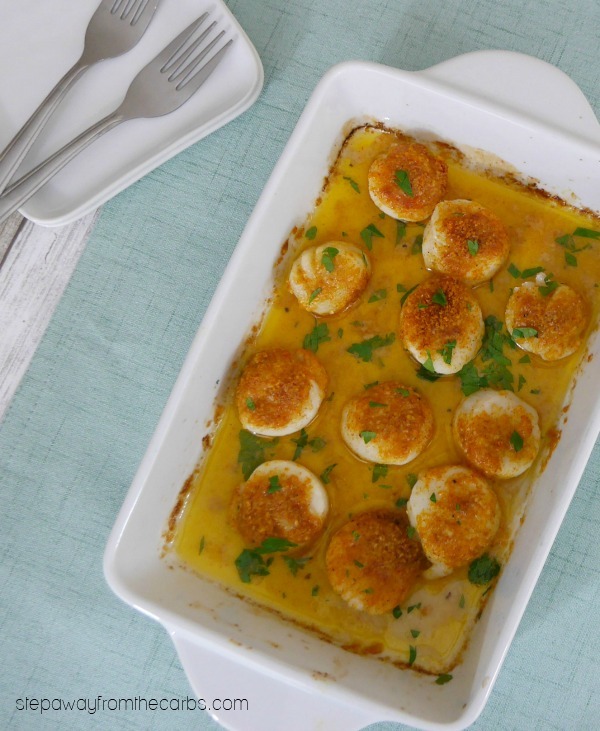 Cheese and scallops might sound like an odd combination, but I assure you that this dish is delicious! And yes, I used that finely grated Parmesan out of a plastic tub. It works absolutely perfectly. If you’d rather not use Parmesan, you could use finely ground pork rinds like in my Oyster Gratin recipe – they work really well, and don’t taste “meaty” at all! And although I’ve written this recipe for two servings, it would be perfectly easy to increase the yield if you wanted to serve more. 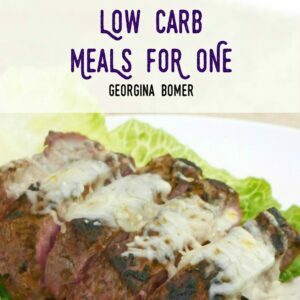 It’s a very versatile recipe! To make the “breading”, mix together the grated Parmesan, paprika, garlic powder, salt and pepper in a small bowl. Melt some butter and pour it into the base of a small baking dish. 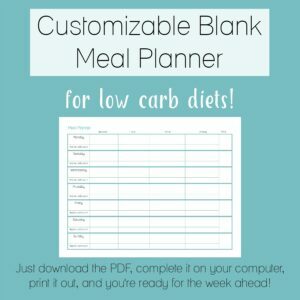 You could add a splash of white wine too, if you like! 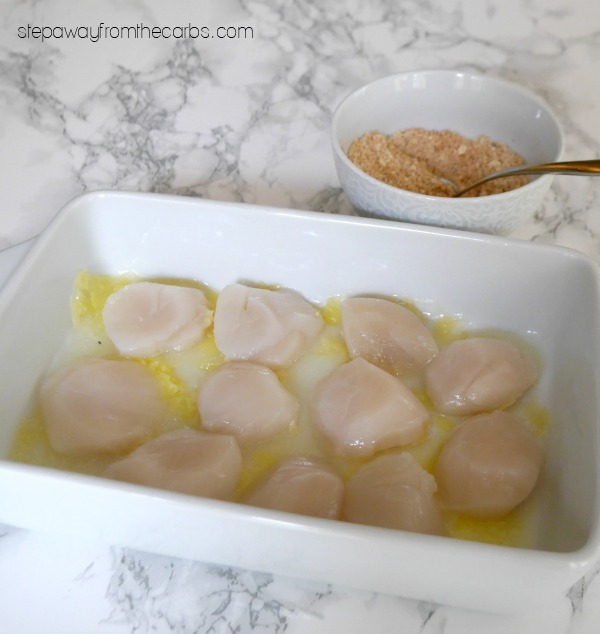 Place the scallops into the baking dish. Spoon the Parmesan mixture over the scallops, then cover with foil and roast for 20 minutes until they reach an internal temperature of 125-130F. Remove the foil, and place under a hot broiler (overhead grill) for a couple of minutes to brown the tops. Garnish with chopped fresh parsley and serve! 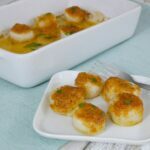 The buttery cooking juice blends perfect with the delicate scallop, and the toasted top is a great textural contrast to the soft inside of the scallop. 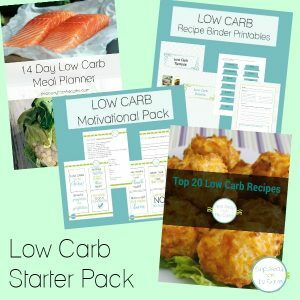 These low carb baked scallops are such a special dish! 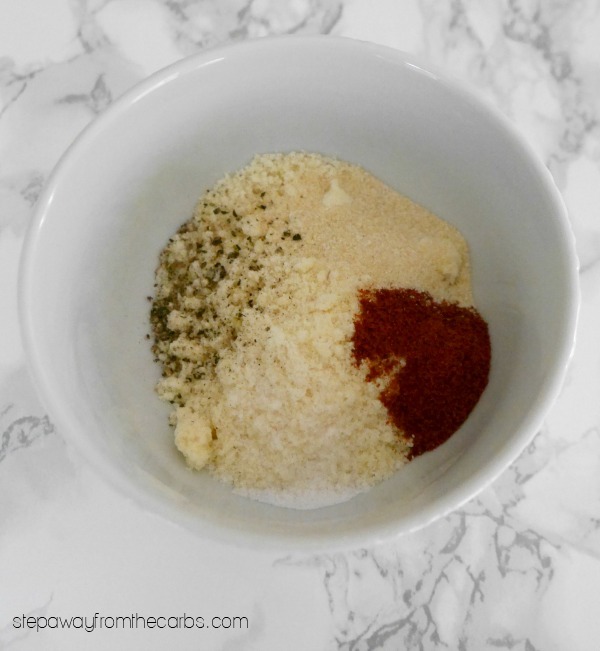 Mix together the grated Parmesan, paprika, garlic powder, salt and pepper in a small bowl. Melt some butter and pour it into the base of a small baking dish. add teh white wine, if using. Place the scallops into the baking dish. Spoon the Parmesan mixture over the scallops, then cover with foil and roast for 20 minutes or until they reach an internal temperature of 125-130F. Remove the foil, and place under a hot broiler (overhead grill) for a couple of minutes to brown the tops.